'La vie en rose' was one of French singer Edith Piaf's most famous songs. The lyrics were written by Piaf, with music composed by Louis Gugliemi. It became a favourite with audiences in 1946. Owing to its popularity, Piaf would include it on many of her albums. Grace Jones recorded a cover version of this track in 1977 as part of her debut album 'Portfolio'. 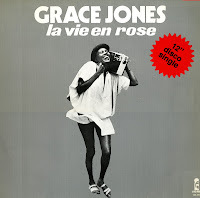 The radical bossanova/disco interpretation of the track became Jones's first international hit single, even if the single version was heavily edited. The original album version was included on this 12" single, lasting over seven minutes.